This is the modern fairy tale story of how one pig was saved, becoming a bonafide celebrity who has –without even trying– convinced hundreds of thousands of people to go vegan. 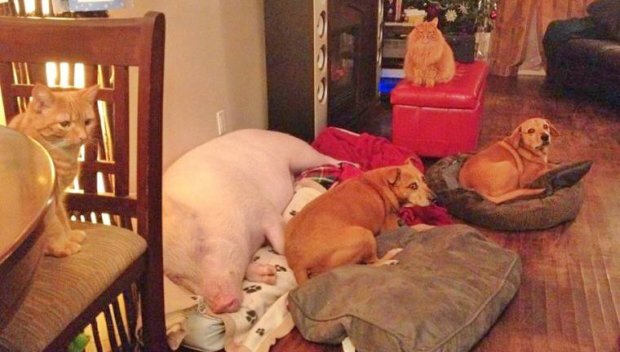 It’s called “The Esther Effect”, and if you’ve ever loved a pet, you can relate! As the owner of a difficult senior poodle, I was intrigued by the idea of a full-size farm animal being as beloved as my own pet. I discovered Esther on Facebook at a time when I was having a lot of trouble with my dog, Rocky. Adopting him when he was just six weeks old, I quickly learned he was going to be a handful. He would freeze at the sight of another dog, he would quiver at the thought of being left alone, and he was never a “sit” or “stay” kind of dog. At the same time, he was the most loyal companion I could have hoped for. We started every morning together, with him jumping up from under my bed, tail wagging. After a few life changes, he had a hard time adjusting and began withdrawing emotionally. Anyone unfamiliar became a threat, and if he was startled he would growl and bite. With the brunt of his caretaking now falling on my aging parents, it would have been easy to give him up. Anyone that has ever fallen in love with a pet knows that you simply can’t stop loving them when things get difficult. 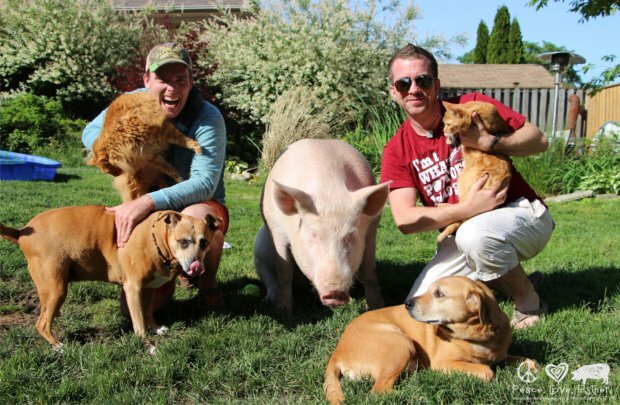 No one knows that better than Steve Jenkins and Derek Walter, pet parents to Esther. Their journey inspired me to keep working with Rocky, and to extend that love to all animals by going vegan. And I’m not the only one. Esther has become an international celebrity, raising over $400k from fans (both Hilary and I donated) to buy farmland and start a sanctuary. Suffice to say, their lives –and the lives of Esther’s uber-devoted fans– have been immeasurably changed. Sitting down for a chat with Steve, we got the story behind the Esther the Wonder Pig phenomenon. Urbanette Magazine: Can you tell us the story of how you came to cherish Esther? Steve Jenkins: Absolutely, it was a completely unplanned and unexpected thing. I got a message online from a friend I hadn’t heard from in years, asking me if I wanted a mini pig. I agreed to take her and met this girl the following morning to pick up Esther. Derek had no idea, so it was an intense day as I tried to come up with a story as to why we all of a sudden had a pet pig. Urbanette: And not just any pet pig, but you soon found out she was a full-size 650 pound pig! At that point, did you doubt whether you could handle her? Steve: It was a strange process. We had been told she was six months old when we got her, and that she came from a pet pig breeder, so she would be no bigger than 70 lbs. We took that info to the vet who immediately told us 70 lbs was not going to happen. [At that point] we definitely questioned ourselves and if we could do it. But at the same time, we had both fallen madly in love with Esther, began to learn a lot about the meat industry, and couldn’t fathom the idea of giving her up. Options for full size pigs finding a loving and proper home are few and far between. She was a pet, and we couldn’t give up on her. Urbanette: I read the National Geographic piece that you were featured in and was surprised to find that passing off average sized pigs as “mini-pigs” is actually common and almost always ends badly with the pigs then being euthanized or sent into crowded shelters. 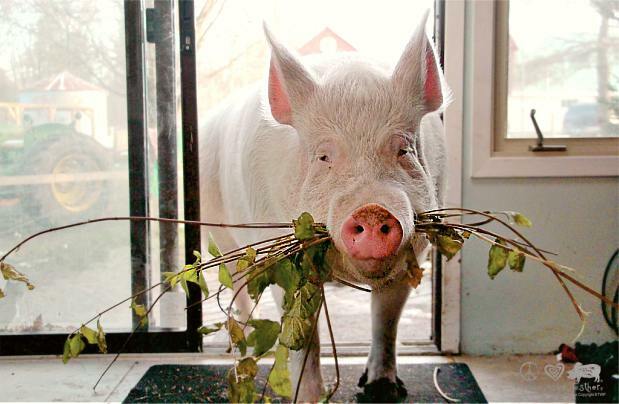 What made you so committed to raising Esther despite her size? Steve: It was a combination of a quite a few things. First of all, she wasn’t a potbellied pig, so the chances of a regular shelter even considering taking her in were slim to none. Shelters are overflowing because people expect a tiny pig that forever fits in a purse, like those designer dogs that are all the rage in Hollywood. When it doesn’t happen, the pig suffers as the human drops them off at a shelter, or worse, sends them to become part of the food industry. Esther was even harder because she was hundreds of pounds larger than a potbellied pig, so who would adopt her as a house pet? 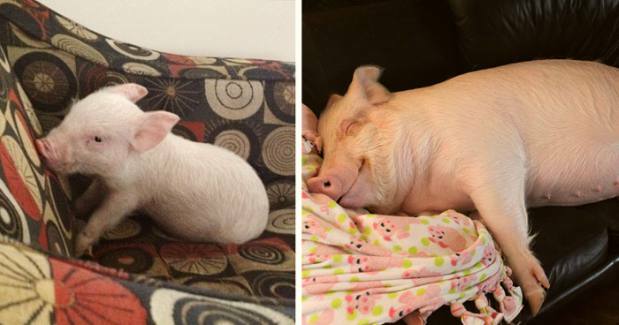 Pigs also have been known to become very attached to their families, and can suffer terrible depression or even death after having been abandoned by their owners. She didn’t ask to get as big as she did, so how could we blame her and make her suffer for it? Urbanette: Can you explain the reality of what life would have been like for Esther in a factory farm? Steve: Esther was born to be a “breeding sow”, which ultimately means she would’ve been a baby factory. She would likely have spent upwards of 3 years confined to a “gestation crate” and artificially inseminated to produce as many litters as possible (typically 2 litters per year) before she became spent, at which time she would go to slaughter. Gestation crates are basically metal cages 6.6′ x 2′, where the pigs have just enough space to sand up and lay down, but not enough to walk or even turn around. It was this thought that resonated with us the most, imagining Esther spending three years in a metal prison was, and still is, heartbreaking. She would likely be nearing the end of her time had she not come to live with us, it’s a scary and very upsetting thought. Urbanette: Wow, and beyond just accepting Esther, you’ve really uprooted everything to accommodate her, raising funds and creating her very own sanctuary – ‘Happily Ever Esther’. How were you able to stay motivated to become so successful with the phenomenon that is Esther? Steve: It’s hard not be motivated when we look at her every day. Our motivation lies in what Esther’s life could’ve been if she hadn’t made it out. Getting to know Esther elevated pigs in our mind from these mindless food items, to unbelievably complex and amazing animals. We had spent our whole lives loving dogs, cats, dolphins, anything cute and furry, all the while eating pigs, cows, and chickens, because “that’s just the way it goes.” Derek and I always considered ourselves animal lovers, and once we got to know Esther, we started imagining her in a factory farm, then we’d imagine our dogs in the same scenario, and we weren’t okay with it anymore. Nobody told us we needed to change, Esther showed us. That’s a very important point and that’s what we try to convey online. Urbanette: She has definitely become a social media star and vegan advocate just by being herself! What is it about her everyday pictures that inspires so many people? Steve: I think it’s the fact that people can see an animal you wouldn’t expect to see in the situations we are able to show her in. She’s the size of a Smart Car but she lounges on our couch, or in her own kiddie pool. The general circumstances are interesting enough to get attention, but it’s the underlying story that I think really hits home. Yes, she’s funny, and cute, and smart, but if she’s all of those things, what about all of the other pigs? She elevates pigs from the barnyard food item most people associate them with, to a member of a family, with friends, and things she enjoys. She has a character, and a personality, and most importantly a face. 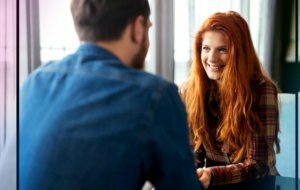 We help people understand that she has feelings, and people all of a sudden make the connection just like we did. We call it “The Esther Effect” and it’s like a light bulb going off. Urbanette: Finally, what has Esther’s impact been on the vegan movement? Steve: We’d like to think she has opened people’s eyes to the idea of changing their lifestyle. Some people, us included, had a wall built around the word “vegan”. It scared us, and we used to think it was a very harsh and judgemental movement. We try to introduce people to the idea by using the term “Esther Approved,” to make it more approachable, and to start a conversation. 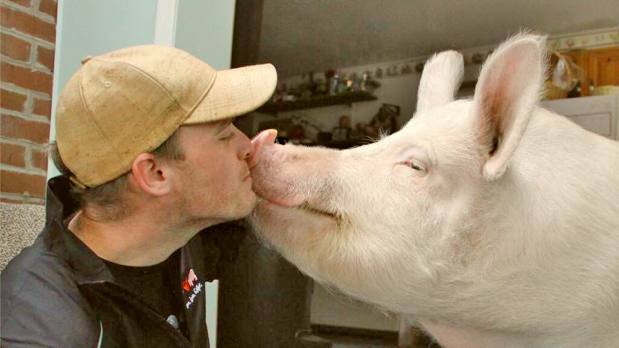 Nobody told us to go vegan, we did it because we got to know Esther and she made us want to change. We have so many alternatives now, why wouldn’t we do something that helps our health, helps the animals, and helps the environment? It just seemed like the obvious choice, and we have a pig to thank for helping us realize it. Urbanette: Thank you for bringing Esther into our lives and for sharing your journey! Check out Esther on Instagram, Facebook and Twitter. After obtaining her Honors B.A. and postgraduate journalism degree, Pegah has written and researched for a variety of magazines and newspapers, with celebrities, fashion and travel being her topics of choice. Now settled in Toronto, she has lived in many corners of the world, including the U.S., Switzerland, and Japan. In her spare time, she divides her love unevenly between her poodle, chocolates and shopping. Any animal can be pets. People just can’t differentiate a pet from livestock. If you don’t want cats dogs and birds, Then, by all means, Don’t eat pork beef and poultry. Simple as that! don’t be hypocrites people. Very very cute, and the luckiest pig on earth, thank thank you for opening our hearts with this story! You’re welcome, the story of Esther deserves to be told! Bravo! Animals enrich everyone’s life – Thanks for sharing! Awww. Bless them for saving her. I gave up all pork products in 2014 and I don’t ever want to go back. Pigs are smart, wonderful animals. Pigs are really smart! They have roughly the same intelligence as a 3 year-old. We share over 98% DNA with pigs and can put their organs into our bodies, so how can we justify the cruel subjugation of mass pig production!!? GO VEGAN! 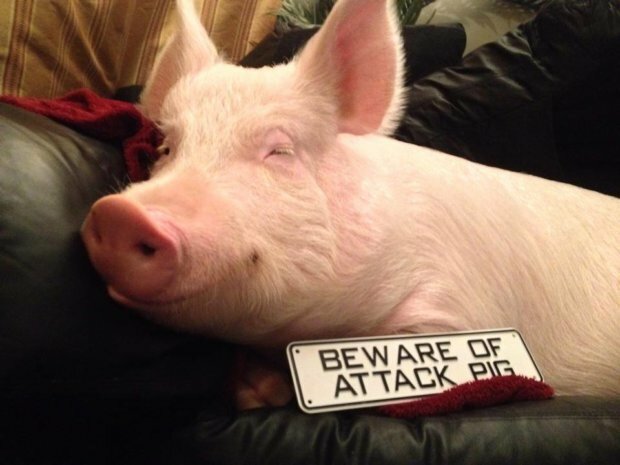 Pigs are way much more smarter than Mmost pets. Me and my husband have a pig as well, we love him so much he is our baby piggy! VERY Lucky pig. 🙂 i love it!